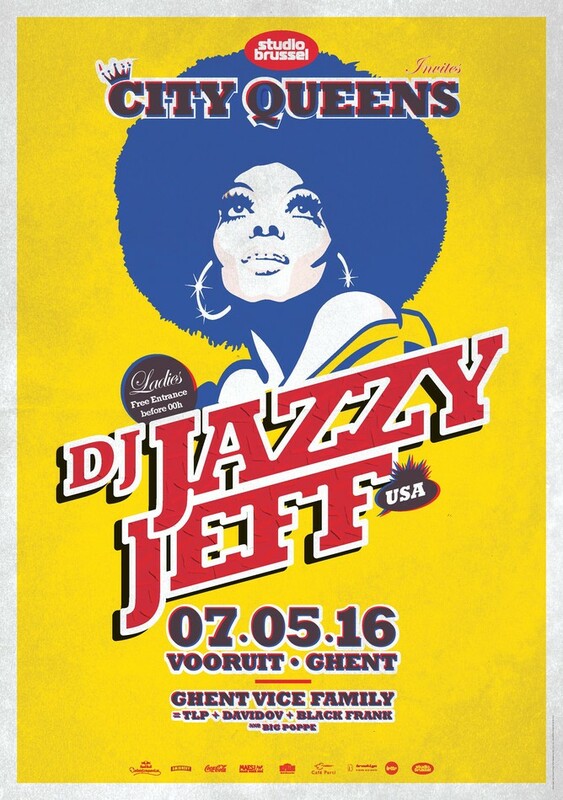 Multiple award winner, DMC champion and icon in the music-industry, Mr. JAZZY JEFF will take over Vooruit to educate, inspire and amuse us in his own amazing style. Jazzy Jeff is known for being a star in ‘The Fresh Prince of Bel Air’, but he’s also a hip hop pioneer and icon who won three Grammy Awards, three American Music Awards, two NAACP Awards, two Soul Train Music Awards and an MTV Music Award. He has recorded with Fresh Prince star Will Smith, and continues to turn out truly majestic albums including ‘The Return of the Magnificent.’ Jeff has also leant his hand to other notable acts including Kenny Lattimore, Tatyana Ali and soul goddess Jill Scott. As a DJ, too, Jazzy Jeff has to be one of the most accomplished in the world, with turntable skills honed over decades. Jeff’s success as a producer pre-empted his brilliant insight as founder and CEO of ‘A Touch of Jazz Inc’, which was a full-scale, musical production facility housing four complete digital and analogue rooms. The studio had a hand in swathes of amazing musical projects including the theme to ‘The Fresh Prince of Bel Air’ television show, a song on The Simpsons compilation album and the theme to the UPN Network’s Between Brothers. Nowadays Jazzy Jeff continues to represent with his solo projects, collaborations, mixtapes and live shows. His love of music shines through in everything he does and in his time he has picked up multiple awards and nominations, yet to this day he states he is in all this simply for the love of the game. Supported by Belgium’s finest dj-trio TLP, Davidov and Black Frank as the “Ghent Vice Family” and Mr. Boogie Nights himself, Big Poppe, you’ll be nothing short of an epic night. If you wish you were a little bit taller or wish you were a baller, make sure to get your ticket in time. If you’re an independent woman, come and throw your hands up but make sure you’re in before midnight if you would like to get in for free … because yes, even with a huge name like Jazzy Jeff, the ladies can still get in for free before 24h.